There’s nothing quite as exhausting as a conference. 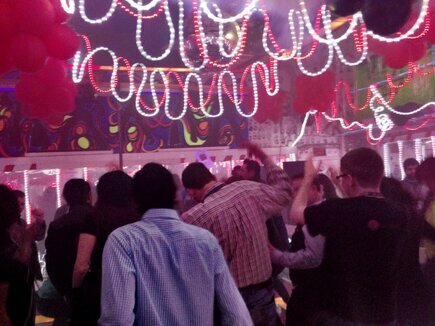 Adrenaline, people, music, advice…everything goes by in a blur and suddenly it’s over. It can kinda leave you wondering what exactly happened. Everywhere Else Tennessee is in the books, and it was a great one. 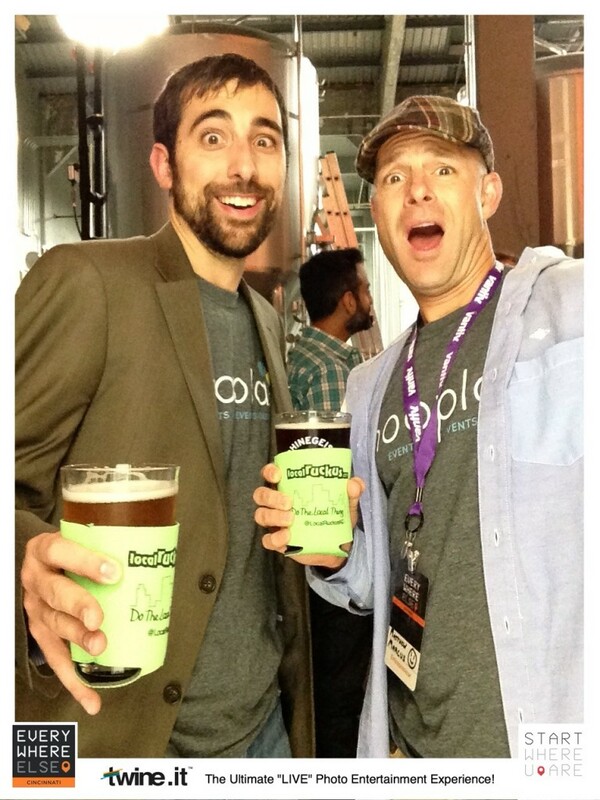 Nick and I want to thank all of our sponsors, speakers, startups, volunteers, and attendees. You all made it an awesome show, and the two of us were really just along for the ride. For those of you who couldn’t make it, you missed an awesome conference. From the opening party through the closing happy hour, the speakers kept dishing great advice on starting up everywhere else. Joel Andren’s talk on startup PR had every reporter nodding along. We want to talk to founders, y’all! Jim McKelvey lied to the audience (repeatedly), and Paul Singh suggested we stop calling ourselves “startups.” And while we’re at it, we’ve got to figure out how to communicate our worth to people, because for every tech job created come 4.6 jobs in other industries. That’s powerful job growth. Techstars Patriot Boot Camp hosted a panel consisting of 4 veterans, all who founded companies after they came home. “Veterans are generally overeducated and underemployed,” Taylor McLemore, founder of the Patriot Boot Camp, told the crowd. Nicole Glaros popped onstage with a beer, after a long flight in from Boulder. “It’s 5:00 somewhere, right,” she quipped to the crowd. Glaros then spent 40 minutes giving 12 practical tips on starting up. A common theme throughout the show was handling failure. 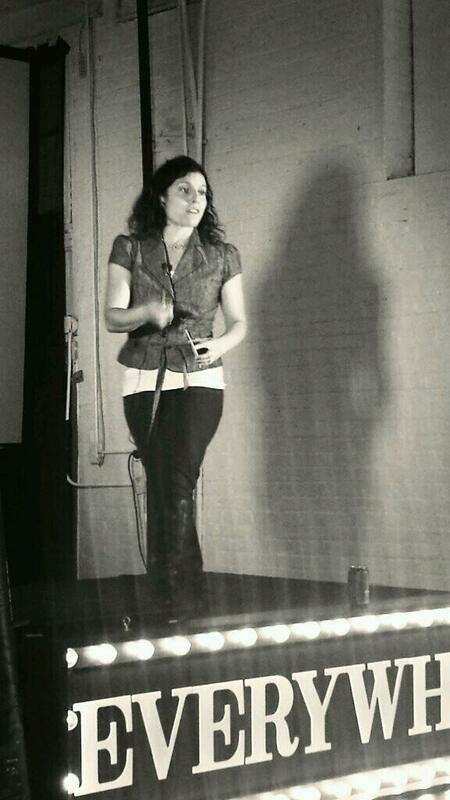 We all have failures big and small that are paving our way to success, and the #EETN speakers were no different. But, turning your failure into your strategy can help you push through anyway. Nait Jones and Chris Lyons finished things off with a great fireside chat on the realities of starting up and the trends they’re both seeing in startup world. Throughout the conference, our 10 startups in the Startup Avenue competed for votes from the attendees. The top 3 presented onstage to the crowd and a panel of 3 judges. Wannado, Wedding Worthy, and Overdog all pitched their startups, giving impressive stats, plans, and growth. In the end, Nashville-based Overdog walked away as the Heavyweight Champion of Everywhere Else. Oh, but there was so much more! You can catch some of the talks over on Ustream, and Ryan Hoover has an awesome podcast with fellow speakers Josh Miller and Ben Yoskovitz you should definitely check out. 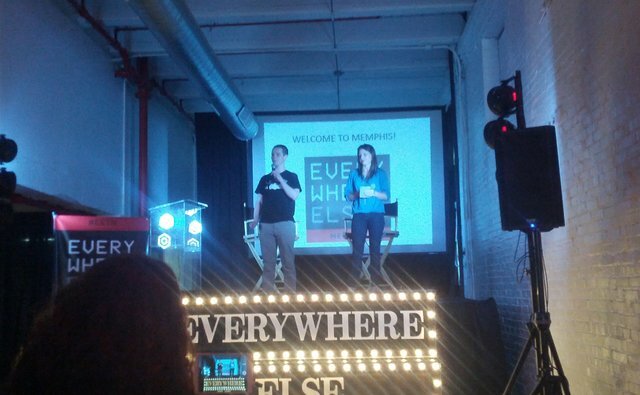 Wrapping up the EE Tennessee Conference this week was the Startup Ave competition. OverDog was selected as the winner of the competition, walking away as the Heavyweight Champion of Everywhere Else. 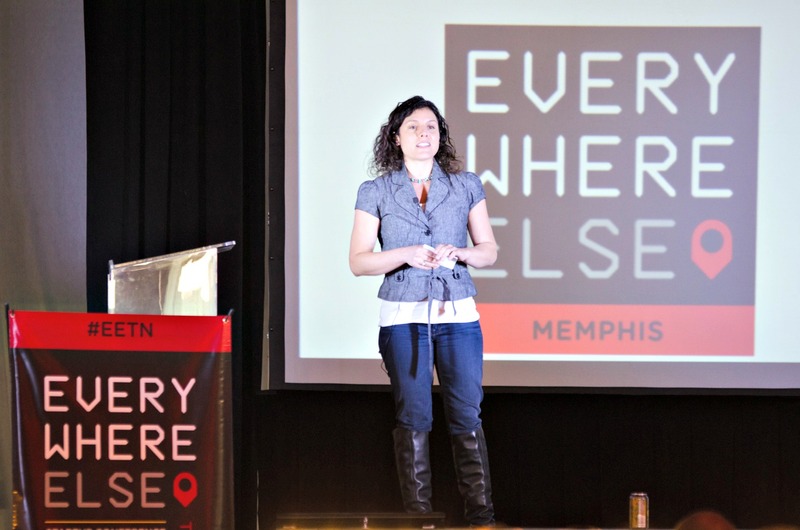 EE Tennessee hosted eleven startups for the event, but only three companies would be selected by conference-goers to move forward to the pitch competition. Over the course of the conference, attendees were able to visit each booth and chat with the companies before placing their vote (a poker chip) at their favorite booth. Companies WedddingWorthy (represented by founder Tameesha Desangles), OverDog (represented by co-founder and CEO Steve Berneman), and WannaDo (represented by CEO Steve Buhrman) were selected to move forward to the pitch competition, a short but intense presentation of their company in front of three judges and conference attendees to compete for funding. The competition was judged by Ben Yoskovitz, Mara Lewis, and Frank Nemanic. WannaDo spoke about offering an events marketing service on the “street level”. Their monetization comes from partnering with local businesses and offering them a unique dashboard and access to user data and analytics to better promote their events. WeddingWorthy functions off of a drop-ship retail model. Instead of charging the user for the wedding project management tool, the service partners with wholesalers to provide a one-stop-shop for bridal parties to efficiently purchase their wedding merchandise. OverDog works off of a partnership model as well, but with professional athletes. The app also has a sponsorship model (just to “pay the bills” though) and noted that one out of three users made an in-app purchase, creating a decent revenue line for the company. Laura Whitener is the Managing Editor for Firmology.com, a technology news and resource site for small businesses and entrepreneurs. Follow them on Twitter! Jim McKelvey speaking at EE Tennessee. 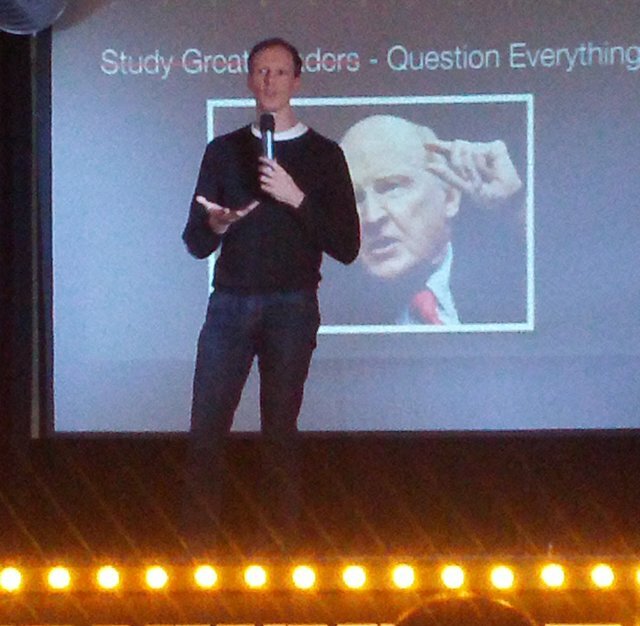 Jim McKelvey, co- founder of Square, spoke at EE Tennessee today. Contradictory to the majority of the conference’s other speakers, McKelvey was adamant failure shouldn’t be an option. • Don’t Seek Opportunities. Solve Problems. The most dangerous thing to pursue as an entrepreneur is opportunity, according to McKelvey. Instead, you should work towards solving a problem. What’s in the way of your success? An opportunity is an illusion, but a problem presents a tangible goal for your company to work towards. What can you solve for your company or your customers? • Don’t Worry About Shipping Great Products. Be Fast and Good Instead. Don’t ship crap, but if your product is good, then it’s good enough to ship out fast. Your product doesn’t need to be perfect, it just needs to work. If it works, that’s really all your customer needs. Get your product out there and worry about softening the edges later. We live in a “give it to me now” society. If you have a usable product, the faster you get it into the market, the faster you start creating a community of users for your brand. • Don’t Invent Something. Assume Technology. Invent when necessary, but don’t fixate on it. Technology shouldn’t get in the way of your success. Chances are the solution you’re thinking about inventing already exists, you’re just not looking hard enough for the product. • Don’t Work Fast. Be Patient. Timing is everything. You can be doing something right for five, ten, fifteen years, but think you’re doing it wrong because your timing is off. It’s your timing, finding the ability to be patient with your work and your method, that determines a successful result. • Don’t Study Great Leaders. Question Them and Everyone Else. Just because it was wildly successful 10 years ago and made that person a thought leader doesn’t mean that idea will work today. Question the leaders. Question those methods. Questioning those methods encourages your ability to think creatively and find solutions that work today, even if they didn’t work yesterday. • Don’t Prioritize Tasks. Make a Don’t Do List Instead. Make a list of things you don’t want to do, that you don’t like, that depress you. Every time you add something to your task list, you’re deleting something else. Declutter your “priorities” and learn how to actually prioritize. You can delegate other tasks and still have success, even if it’s not done “your way”—delegating frees up more time for you to focus on those real priorities. • Don’t Be Bold. Humbly Persevere. Fear drives us. If you keep going, keep pushing through, you’ll eventually make it to the end. If you have a fear of failure, then you have motivation to seek success. But evaluate the risks you take. Make smarter choices as you push through the speed bumps with your company. 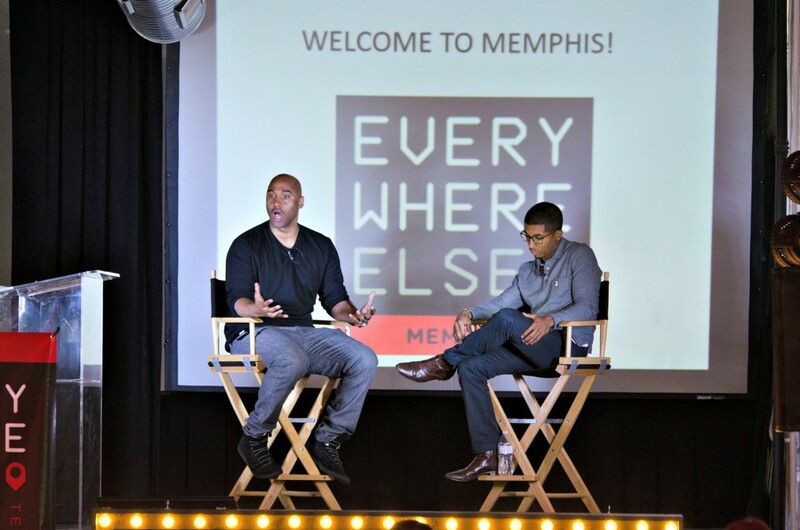 Paul Singh, Co-founder of Disruption Corporation and Crystal Tech Fund and Partner at 500 Startups, told it like it is at Everywhere Else Tennessee on Thursday. That was one of Singh’s final comments of his presentation. And he’s certainly done so. Singh has invested in over 650 startups hailing from almost every one of the fifty states in, give or take, less than five years. “Early stage startups have changed. It is ‘everywhere else’ now,” he said, speaking on entrepreneurship outside of the well-known hubs like San Francisco and New York. Paul highlighted the ideas that small businesses are easier to start now more than ever before, the importance of tech companies and their impacts on local economies, and the difference that can be made when there are concentrated pools of smart people in one place at one time. 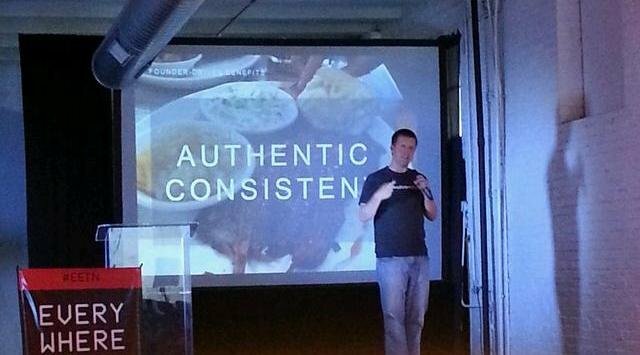 “YOU CAN BUILD A BILLION DOLLAR COMPANY FROM YOUR COUCH IN A T-SHIRT” read one his slides. “It used to cost $5 million to start a tech company in 1999. Now you can start an entire internet service company for less than $5,000,” he said. So, next time you step up to the plate, do the ‘Babe Ruth point-your-bat-at-the-outfield’ and knock it out of the park. Then sit back down on your couch (in your t-shirt) and do it again. Paul is the founder of Disruption Corporation, which provides tools, research and advisory services to corporations, angel investors and venture capital firms. Previously, he was a Partner at 500 Startups, a 4 year old “super angel” fund headquartered in Mountain View, CA and has overseen the investments in 500+ companies across 35+ countries. He is currently serving as an Entrepreneur in Residence with the White House Office of Science and Technology Policy and DHS/USCIS. 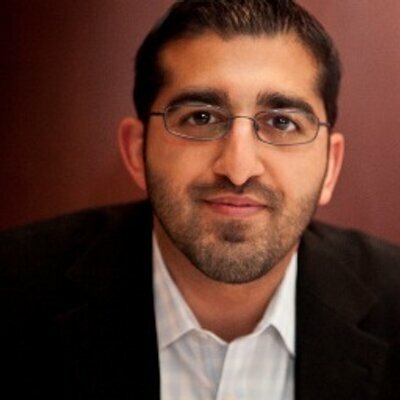 Follow Paul at @paulsingh. Building a company isn’t easy. One of the common themes at this year’s EE Tennessee conference was that most of the speakers spoke about utilizing failure. The benefits to failing, it seems, can be the probiotics for your eventual success. Jared Steffes used his failure to take his company to a new market. Nicole Glaros encourages failure as an entrepreneurship development strategy. Tony Monteleone used his failures in the corporate world to become the progressive entrepreneur he is today (even in shorts and a T-shirt). A trail of failure can mean a launch pad for success if you know how to use it as motivation. Why did you fail? How can you correct those measures? Was it really a bad company idea or was the idea just poorly executed? Steffes’ original strategy wasn’t working because his company simply wasn’t in the right market. So he moved to a new market, a market that had interest in what his company was aiming for. Glaros said that 65% of startups fail due to poor communication, which means poor relationship management. Monteleone’s first startup failed because he couldn’t communicate well with his other cofounders. Your company will depend heavily on communication and good relationships. You have to be able to talk to your team regardless of whether you’re failing or succeeding. How can you measure your success, or your failure, when you have no statistics? Why don’t you have users? Why aren’t you getting unique hits? Why is your bounce rate so high? But don’t strangle your company with those metrics. Choose one to three and use that data to move your company forward. Community is key to bouncing back. Your failure will be the end of the line for your endeavors if you don’t have a support network, peers, mentors, and community resources to fall back on and help you bounce back up and get going again. Nicole Glaros speaking at EE Tennessee. Glaros, managing director of TechStars in Boulder, CO, spoke about how to run a tighter ship when it comes to managing yourself and your team. Storytelling is the best sales strategy you can have in your arsenal. If you can’t sell your product, your service, the brand of your company, then you can’t win it. Branding is storytelling. What’s the story of your business? How are you going to convey that without overselling your company? You won’t get far if you’re lying to yourself or your team. Be realistic about your skill sets. What can you do well? What do you need help with? Be honest about why you’re starting your company. Is this a casual endeavor or do you want to push your venture as far as you can? Surround yourself with a team that will keep you honest and motivated. Along the same line of being intellectually honest, you need a team who will hold you accountable and rally around you when you need an extra hand. Support yourself with a coach or by joining a peer group. If one doesn’t exist, start one. Surround yourself with people who can help you find solutions to your problems, help you create a better strategy, and keep you intellectually honest as you build your company. Learn how to ask the right questions, listen between the lines, and gauge the needs of your customers. Good listening is key to identifying your opportunities, and your opportunities will allow you to become a storyteller. 65% of startups fail due to communication issues. Sixty-five percent. Communication issues tend to stem from entrepreneurs asking the tough stuff right up front. Who gets what? How much am I getting? What happens when I’m not meeting goals? When you’re not meeting goals? Communicate, keep each other intellectually honest, and learn how to have a non-emotionally charged conversation to get you and your team over the speed bumps you’ll encounter. There’s a difference between working and getting stuff done and working for the sake of saying that you’re busy. The glorification of the concept of busy is overworked. What’s the point of working a 15 hour day if you can’t quantify or even identify what you accomplished that day? Block off your time. Schedule yourself. Set aside a specific time block for email, for meetings, for working with your team. Assign priorities 1, 2, and 3. Hold yourself accountable to complete your tasks. If you can’t complete P1, then stop everything else until it is complete. Gut-check yourself. Where are you spending all of your time? Are you coffee dates eating in to your ability to complete your tasks? Are you spending too much time on email? Are you cutting out of work early? Failure is not the end of the world. Encourage risks, failure, and encourage your team to get back on their feet from those failures. Use your failures as fuel for the courage to try again. You have to aim your company somewhere in order to reach for a goal. The higher you aim, the more risks you’ll take. Aim high and then create a plan on how to get there. Where do you want to be in a month? A year? Five years? How are you going to get there? Who is going to be on your team to help get the company there? Metrics can help guide your business. How many users do you have? What’s your conversion rate? What are the key drivers of your business? How can you evaluate how your company is doing if you can’t track that data? The answer is that you can’t. Put three metrics in place and work with your team to track, change, and evaluate them. Block out your time, keep to a schedule, and maintain your momentum. Do things consistently with your company—your meetings, your content, your reports, your communication. You’re A-team isn’t necessarily going to be comprised of people with the most experience or expertise. They might have a lot of knowledge, but will they have that raw talent or enthusiastic work drive? Hire someone who has a lot of raw talent, passion, and willingness to work hard for your company. When you do, you’ll gain people’s trust. These people will become your community, your supporters, your loyal brand users. In a panel discussion moderated by Taylor McLemore, founder of Techstars Patriot Bootcamp, Mark Morris, CEO and Founder of MyGigline, Tameesha Desangles-Wilson, CEO and Founder of Wedding Worthy, and Jen Pilcher, CEO and Founder of Military One Click, gave us some real, in-depth insight about what it’s like to have military DNA and work in the civilian world. The following are quotes from Taylor, Mark, Tameesha, and Jen. The moral of the story: veterans are extremely loyal, hardworking, and versatile potential employees, and you don’t have to look far to find them. Follow each of them here: Mark and MyGigline at @mygigline; Tameesha and Wedding Worthy at @WeddingWorthy; Jen and Military One Click at @military1click; and Taylor and Patriot Boot Camp at @T2theMac. When driving visibility for your venture, whether you’re still a startup or a profit-generating company, having a strong PR campaign is crucial. 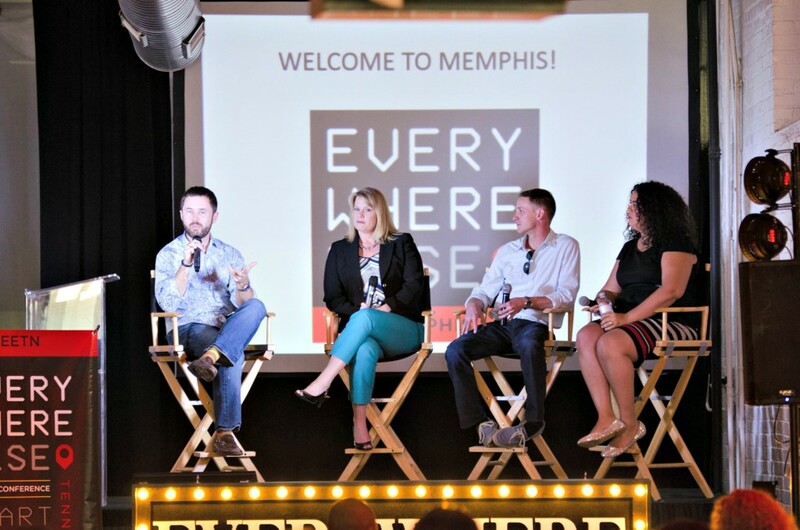 But, as Joel Andren (founder and CEO of Press Friendly) spoke about today at EE Tennessee, hiring a PR agency isn’t actually your best bet. Driving your own campaign is the best way to create authentic, consistent visibility for your business. Reporters, those people who are going to give you press, want to talk to the founders, the people who live and breathe the business. Not some PR rep who will only push out rote message or forward on boring press release copy. Managing your own campaign gives you control over the message and image the press gets of your business. Branding methods, and PR campaigns, are changing. Consumers now are looking for a story behind their business. They want someone relatable, trustworthy, and genuine to connect with. Consumers don’t want a faceless business that touts a customer focus… yet isn’t focused on the customer. Andren talked about how working with multiple PR agencies, trying to find “the right agency” who will “get” your business, can create an inconsistent view of your business: each agency will tell you that they have the answer to your campaign, meaning that your message and image changes each time you change PR agencies. Constant change doesn’t exactly instill confidence in the consumer. Owning and driving your own campaign creates the direct connection with your customers because reporters are now speaking with the founder of the company, the face of the business who was there from the very beginning of the story. Your business isn’t a sound bite or a press release. It’s a business. You have something to offer, be it a product or a service, and you know your business better than any PR agency ever will, no matter how many meetings you have. 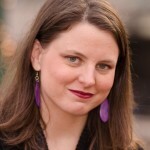 Laura Whitener is the Managing Editor for Firmology.com, a technology news and resource site for small businesses and entrepreneurs. Follow them on Twitter. EE Tennessee attendees mingle at Startup Ave.
Community size can flux, but for entrepreneurs it’s not the size that matters, it’s how real it is. Community means vitality, which means loyalty early and later down the line. At EE Tennessee, the first three speakers of the morning all spoke about one common idea: community being vital to a business. Jared Steffes, founder and president of FuryWing, Ryan Hoover, co-creater of Product Hunt, and Mike Muhney, co-founder of ACT!, all spoke about tapping in to community, pre-existing or not, to build their success. Branding yourself as the guy who simply sends out a spammy Tweet or email with a link to “read more!” won’t get you far. Meaningful relationships, or at least communication, is the foundation for gathering a community of potential users, early adopters, and brand loyalists. If you don’t have something meaningful to say or if you can’t put in the time to maintain a conversation with someone, are you really contributing to a community or are you spam marketing? Just because you’re based in Chicago, Silicon Valley, or New York doesn’t mean that you have instant access to a community who is ready and willing. No one can be everywhere at once, but you can be mobile and move to where your audience is. Host a meet up. Go to a conference and mingle. Making yourself visible and accessible opens a lot of doors for community builders. Can’t meet up in person? You can still maintain genuine contact. Email or other one-to-one sources of getting and staying in touch can promote a more personal feel. Even if you’re sending out a simple form-style email, by directly addressing that member of your community, you’re more likely to get a response because you’re establishing a connection instead of automating a process. Building your community before your brand means gathering the loyalists before a product. Your community can be a vital tool for bringing your business from garage-based startup to office-based success by simply hosting conversations about your brand. Involving your community from the beginning gives both you and your followers something to talk about, which gets other people talking. Drive interest by creating interest. Those early adopters can drive the voice and the life of your community. According to Hoover, a loyal community member is the best marketing for your business: they’re more likely to Tweet about, Facebook about, and talk about your business, and with a little schwag you even can make them feel like a valuable member of your business’s community. Without community, or clients, or users, or customers, businesses don’t work. Build a better community to build your brand. 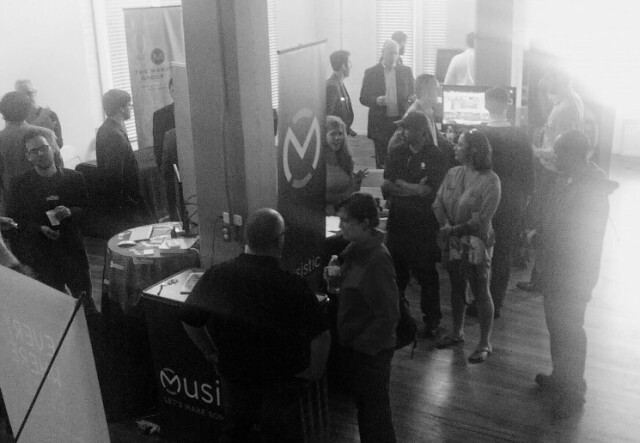 With 200+ registered attendees, a successful kickoff party in downtown Memphis and the first speaker, Jared Steffes, President and Founder of Furywing and Co-Founder of Tap.Me, in the books and Ryan Hoover of Product Hunt on the stage now, we have begun. We’ve got a full lineup of speakers for the next two days, which you can see here, each of which is sure to bring some excitement to the stage. 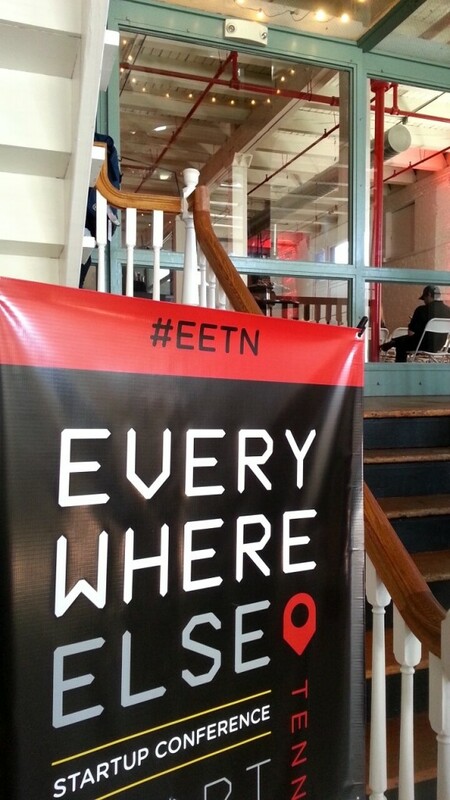 Follow the action live on Twitter with the #EETN tag (or by clicking here), and we’ll see you soon. 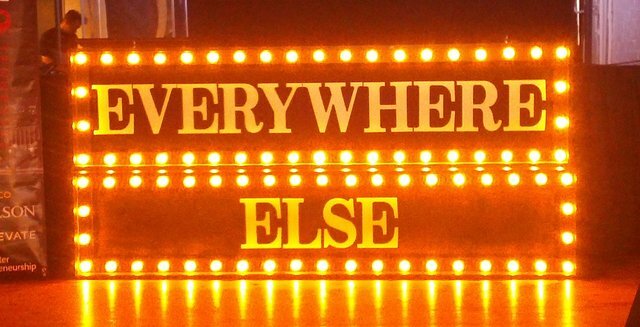 Join Us for The Everywhere Else Tennessee Opening Party! We’re Beale Street Bar Hoppin’ tonight, starting at Silky O’Sullivan’s at 8PM. Then we’re hitting a few more Beale Street hot spots before the night’s over. Find out more here. The Bar Hop is open to the public, no badge required. But, if you still want to join us for the whole conference, we’ve released just a few more tickets. Register now and don’t miss out on our awesome lineup of speakers and 2 more killer parties. 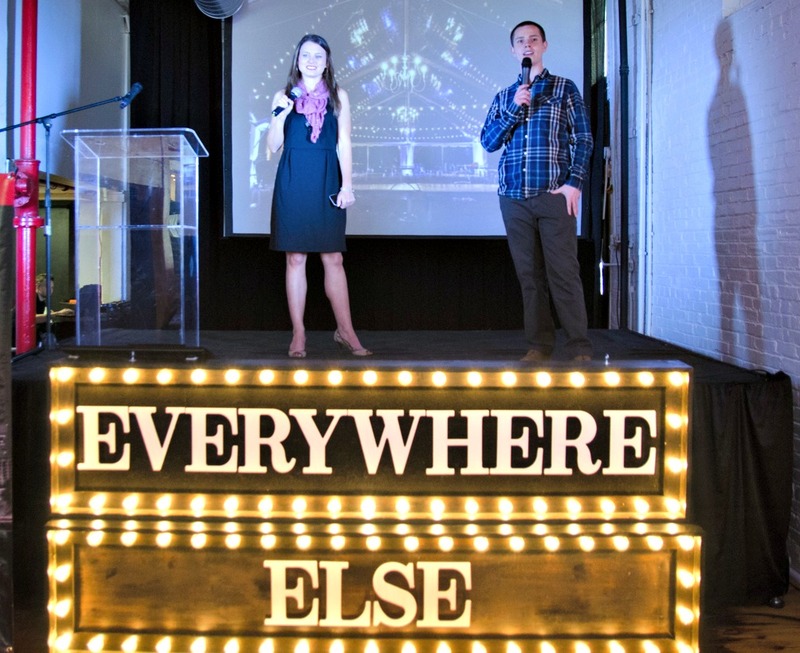 The Everywhere Else conference series is about inspiration, education, and connection. We especially love getting you connected with each other and with our speakers. And, with that in mind, we’ve got some awesome parties planned next week. A trip to Memphis wouldn’t be complete without spending some time on the historic Beale Street. And great news! You don’t have to have a badge to attend the bar hop. We’re starting the party at Silky O’Sullivan’s. Join us on the patio for drinks and soak up the Memphis atmosphere. 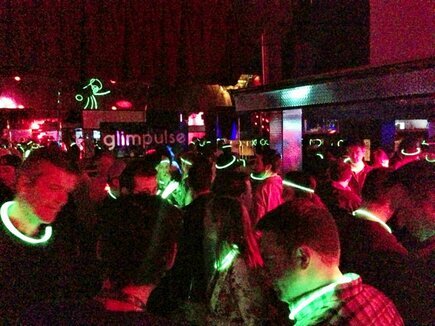 Later, we’ll take over the top floor of Club 152 for a glos stick-lit dance party. The Grizzlies will be battling it out in the playoffs, and royalty will be heading into town, but the best party in town will always be Everywhere Else TN. Thursday night we’re heading to the Rumba Room on South Main Street. The party is closed to the public, but conference badge holders will dance the night away with an awesome DJ and Baker Donelson. Nothing closes out a conference like a happy hour. After the conference, badge holders can mingle at 409 South Main. We’ll provide wine and local craft beer, and you’ll provide the great conversations and connections. Everywhere Else TN may wind down, but the annual Beale Street Music Festival will just be kicking off Friday night. Join conference organizers and speakers as we unwind and check out some awesome bands. You can find more details and get tickets here. Don’t miss out on these great parties and all the other great things happening at Everywhere Else TN. Grab a ticket before they’re gone. T-minus 15 days until the kickoff of Everywhere Else Tennessee. And, like all great events, we have a few surprises in store! First, we’ve added 3 new speakers to the lineup. 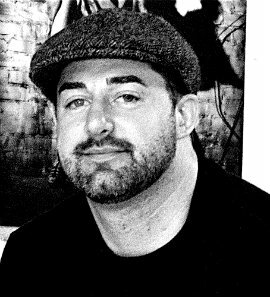 Danny Boice is the Co-Founder & President of Speek. Speek lets users do conference calls with a simple link (speek.com/YourName) rather than using phone numbers and PINs. Danny attended Harvard, is a Forbes columnist, Adjunct Professor at Georgetown and was recently named a Tech Titan by Washingtonian Magazine. You can find Danny on Twitter @DannyBoice or LinkedIn here. Steve has more than 25 years’ experience as an executive, inventor, investor, software developer, and technologist in the computer industry. 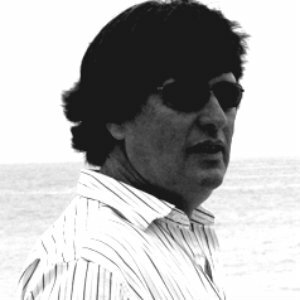 On top of being the author of several award-winning programs, he is also the managing partner of the startup fund RadWeb Technology Partners, investor member of New World Angels, board member of the Miami Innovation Fund, and sits on the board of the Silicon Valley-based non-profit International Data Portability organization. He is also a member of the OpenAjax Alliance and the OpenWeb Foundation and frequently speaks on topics related to startups, crowd-funding, financing, advanced technology, Web 2.0, open source, data portability, and the real-time web. He also rode, and made the first investment in, the very first Startup Bus. 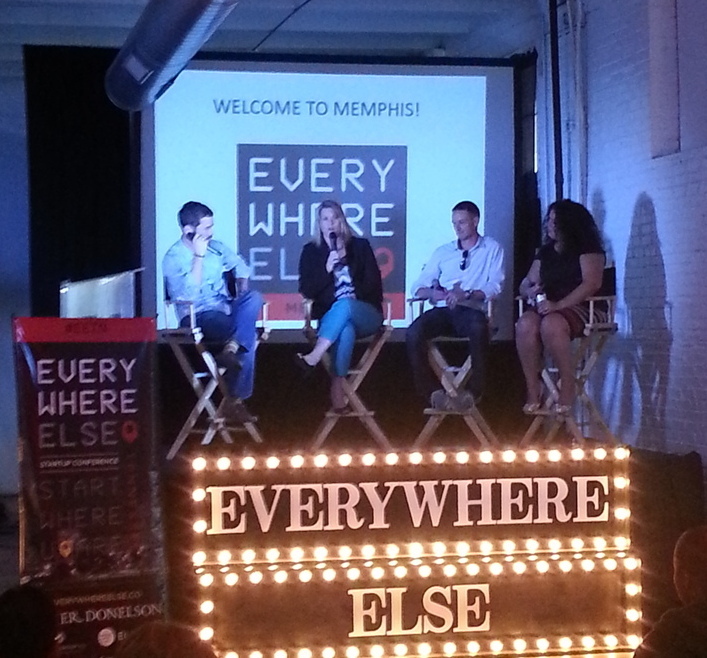 There are some amazing startups in the Startup Avenue at Everywhere Else Tennessee. You met them last week, and spent the week voting on your favorite. And, man, did y’all vote! 24,000 votes were cast, and it was a tight race. Congratulations to Wannado for being chosen as the Startup Avenue Fan Favorite. Wannado will join 3 other startups in a Pitch Competition on Friday, May 2. We’ve also added one last startup to the Avenue. Musistic is a Memphis-based music technology company whose product allows musicians to record with anyone, anywhere, anytime regardless of which recording software is being used. And the forthcoming Co-Lab, will allow musicians to expand their musical network by creating a global market place for musical talent and collaboration. 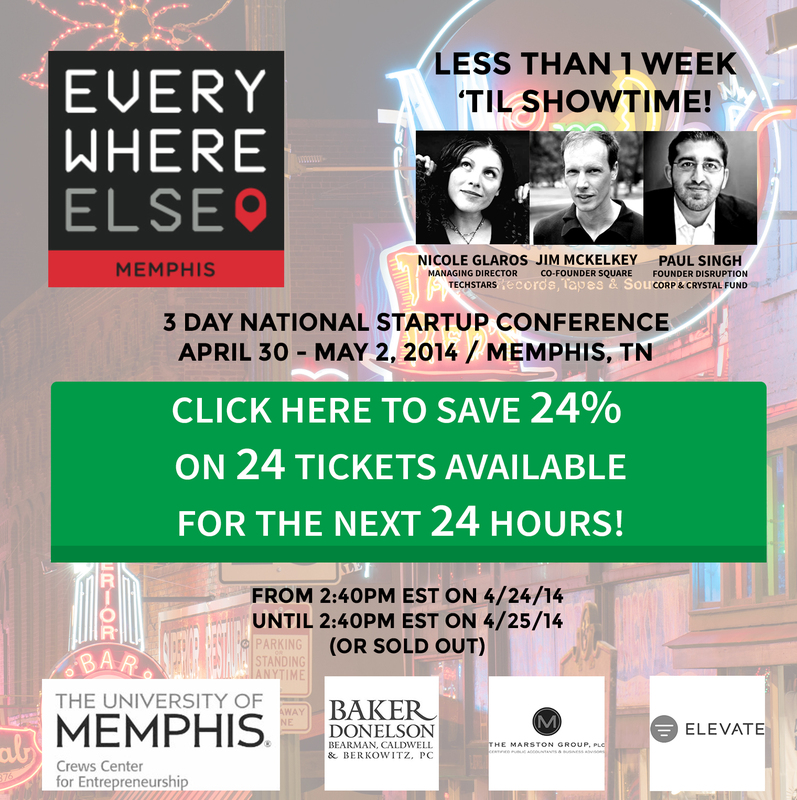 Meet all of our speakers and startups in just 2 short weeks. Grab your tickets here, if you haven’t already.